The Itty Bitty Kitty Committee: More Fun Than Expected! Ellis and Opal had planned to spend the last days of spring break vacationing at the ocean but in the last minute plans fell through, and they ended us spending yesterday at our house. 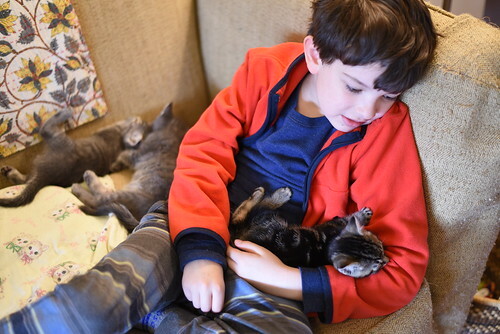 With five kittens here, keeping Opal and Ellis occupied all day was easy. We spent the first hour of their visit discussing tabby patterns and lynx ears and learning names. 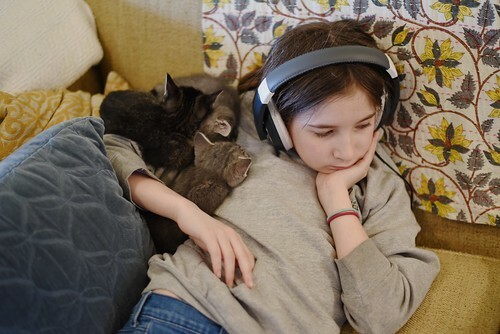 While the kittens were active, they played with the kittens, and when the kittens got tired, they tried to lure as many as they could to their laps and they rested with them. They guessed which kitten weighed the most and who weighed the least and then put them on the scale. We filled five dishes with lunch, then watched the kittens eat. 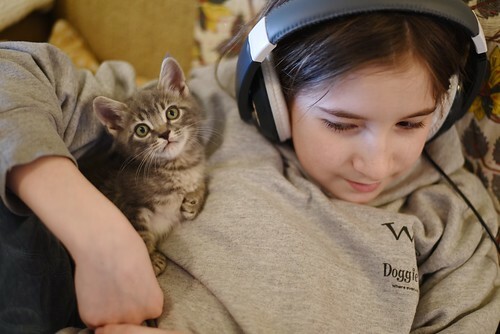 They decided which kitten they would keep if they could keep a kitten then changed their minds a dozen times. In the end, Opal's pick was Spencer and Ellis' was Beau. When the day was winding down, Ellis said, "I had way more fun than I expected to have." I laughed and Opal explained, "He meant that as a compliment." 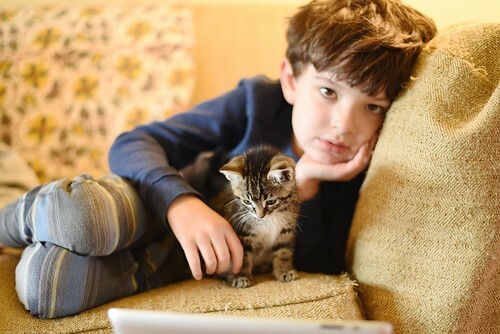 It was a fun day for humans and kittens, too. 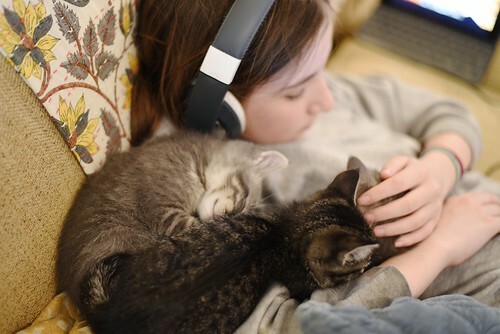 Now that is how one should spend a Spring Break - being a bed to some sleepy kittens! Lucky Opal and Ellis to have that chance. 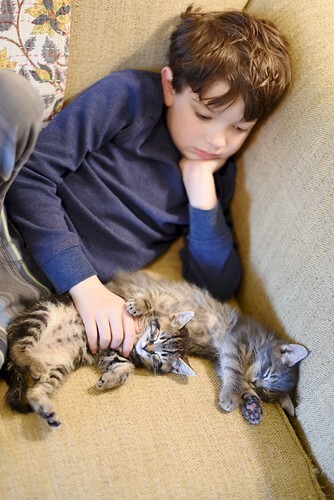 A day of treasure for both kittens and kids. Does not get better - especially when rainy outside. That is definitely how I wish I could spend a Spring Break if I still had one. 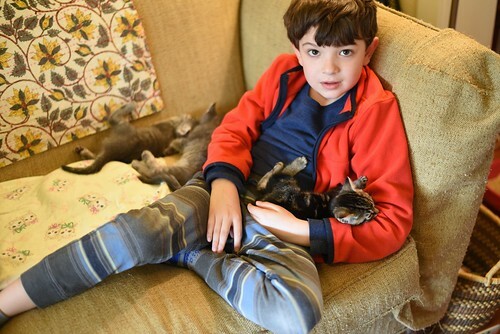 Lucky kids + lucky kittens! Sleeping kittens piled on Opal and Spencer. So cute! A great alternative to the ocean. 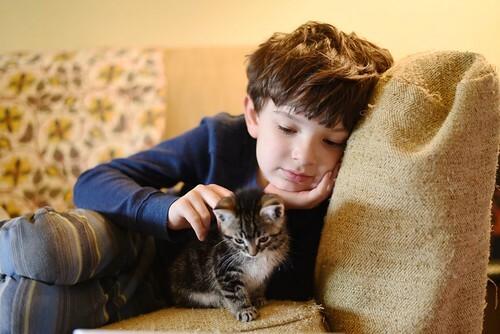 You know..they are going to be kitten wranglers when they grow up...wonderful photos! I do hope Miss Bean and Wylla did a good "Pat Down" as Opal and Ellis left; I would not have trusted there to be 5 kittens in the house after that visit! 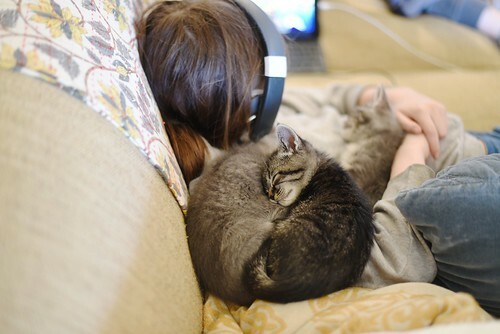 I just wish I was nearer and could come and Kitten-Nap with a Tabby in my arms. I totally agree with lizlake above, wish I was closer so I could come visit! 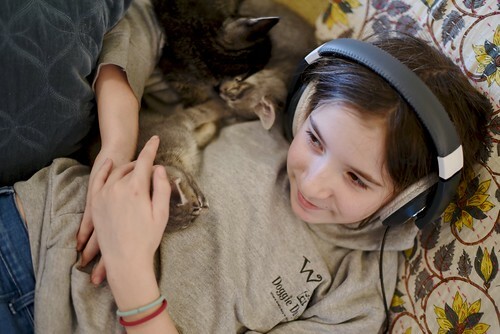 The kids are not going to forget this afternoon they shared with the kittens. 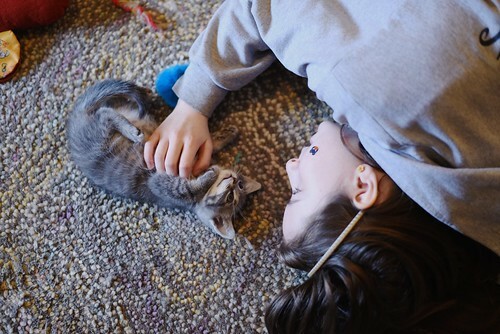 Precious moments. I'm not a kid person...like, at all. But man, I like THESE kids! So sweet and gentle (and generous). 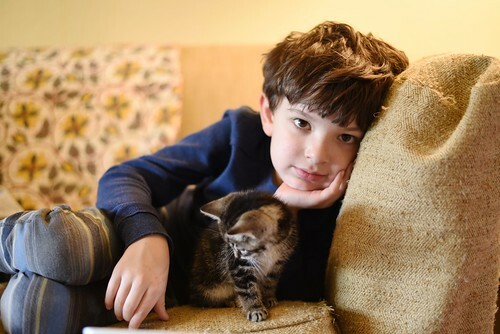 What a lovely time for kids and kittens alike. It looks like they had a day straight out of heaven. 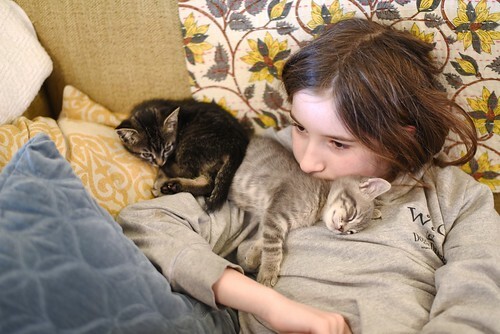 That first one of Opal with kittens draped sleepily on her shoulder is complete perfection.